HUGE news, System Of A Down fans!! The band have just announced their first run of shows since their Wake Up The Souls Tour of 2015 – with none other than Incubus, and support acts At The Drive In, Clutch, Pallbearer and Skeletonwitch – it’s really more of a one-day rock festival than a regular concert!! No SOAD or Incubus fan can afford to miss this – get your tickets NOW to see System Of A Down, Incubus, and more at the San Manuel Amphitheater on Saturday 13th October 2018!!! Few metal bands can be said to be more unique, recognisable or innovative than System Of A Down. Four-times Grammy nominated, with sales of 40 million records across the world, System Of A Down have retained enduring popularity. Despite not releasing any full-length albums since 2005’s “Mezmerize/Hypnotize,” System Of A Down have remained a strong and steady touring unit, simply gaining more fans as time goes on for their full-on and high-energy live performances. Incubus, on the other hand, are continuing to tour with the release of their first full-length album since 2011, “8," released in April last year. System Of A Down have confirmed that they have new material written, but haven’t decided “how things should be done for us [the band] to be able to move forward with it”. It’s possible that 2018 may be the year – but either way, System Of A Down promise an epic performance that you’re not likely to forget in a hurry!! 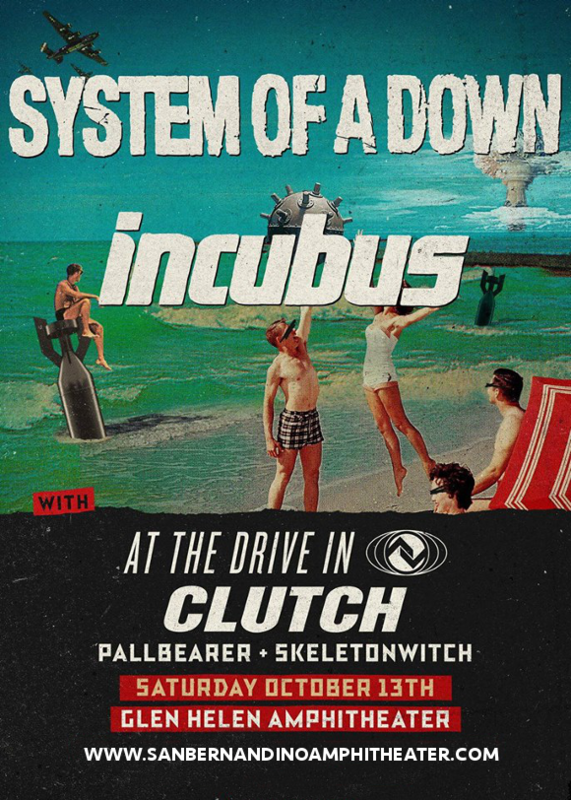 Don’t delay – get your tickets to see System Of A Down, Incubus, At The Drive In, and more LIVE on October 13! !